When you think of landscape in 19th century California, images of Southern California seldom come to mind. Paintings of Northern California, depicted in Albert Bierstadt's incredible paintings of Yosemite, or Carleton Watkins' crystalline photographs of Half-Dome, are ubiquitous, but what about images representing the rest of the state? In the late 19th century, Southern California's human and natural geography transformed as millions of new residents settled its semi-arid desert world, but artistic renditions of this region seldom get the attention of its northerly neighbors. But why is this the case? To understand the history of Southern California's artistic representation (or lack thereof), it's important to consider the representation of the area's geographic development. To do so, one should look to the East, to the natural resource that underwrote its transformation: the Colorado River. And in doing so, another revelation comes to light: landscape imagery did more than depict the area; these pictures were cultural partners in shaping Southern California's economic, political, and physical infrastructure. 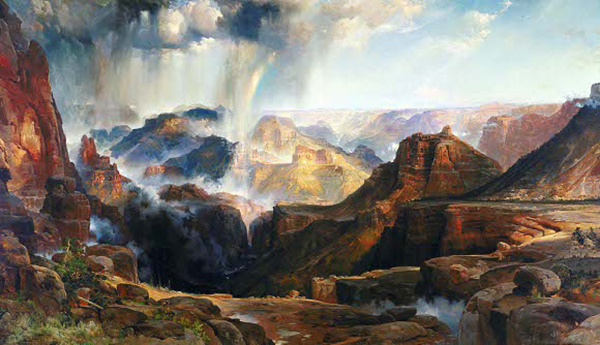 In August of 1873, John Wesley Powell, a one-armed Civil War veteran-turned-geologist, and the 36-year-old English-born painter Thomas Moran stood at the edge of the Grand Canyon. A government-sponsored exploration of the Colorado, the Powell Survey was part of a decades-long effort to generate an accurate image of the native cultures and natural landscapes of the American West. To do so, the U.S. Geological Survey sent explorers, cartographers, photographers and artists on expeditions to map the expanding nation through scientific studies, narrative records, and visual renderings. Beyond simple observation, the surveys created a visual synthesis of the experience of being in the Western landscape. The paintings, drawings, and photographs related a sense of wonder and identification with Manifest Destiny -- these divine rivers, mountains, and fields seemed destined to fall under U.S. cultivation. This imagery encouraged settlement, tourism, and commerce to take hold in new territories, and elevated landscape as a subject of national pride. Painters of the late 19th century were intimately familiar with geology, cartography and exploration. Landscape topics were ripe metaphors for expansionism and exceptionalism, and popular with merchants and industrialists who were major patrons of the arts. Moran himself became famous with an earlier painting inspired by his travels with Powell on the upper Colorado. Invited back for the 1873 Grand Canyon expedition, he spent a week with the geologist, venturing and conversing around the rim. As Powell gathered research for his famous study of desert ecology, Moran was preparing for an epic painting, and created hundreds of sketches noting everything from rock formations to plant life in closely observed detail. Back in his Newark, New Jersey studio, Moran created The Chasm of the Colorado as a combination of field studies and the artist's own evocative imagination. 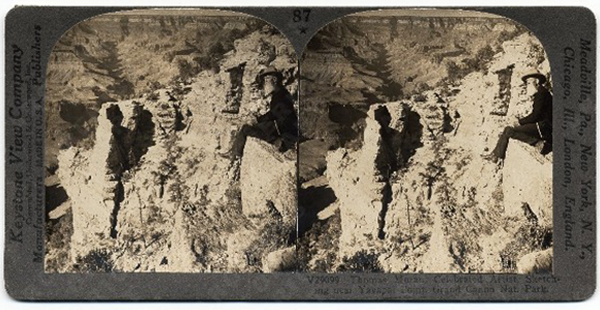 It is an epic 7x12' panorama that remade the river-carved badlands of northern Arizona as a thing of beauty. 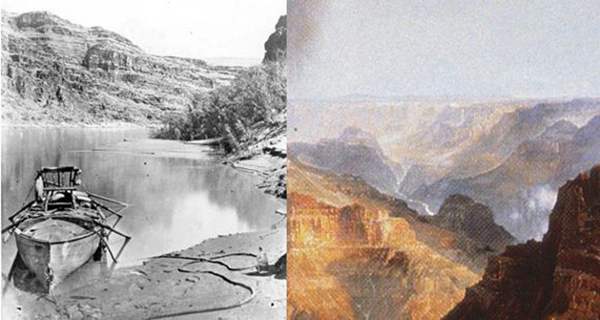 Unlike the scores of photographs taken on the trip, in Moran's painting the Colorado River barely makes an appearance. The agent of change in the landscape appears like a buried clue, a little silver thread glinting in the distance. Moran spent the remainder of his career both painting original canvases and reworking sketches from his survey expeditions, his images templates for the guidebooks, posters, and calendars of the Atchison, Topeka & Santa Fe, Northern, and Southern Pacific Railroads -- all looking to capitalize on landscape's cachet as national imaginary. The 1892 painting of the Grand Canyon (from a different vantage than Chasm) he created specifically for the Santa Fe for promotional use was in wide reproduction, even included as a special giveaway to Los Angeles Times subscribers.2 As the railroads raced to build lines through the arid southwest to new urban hubs in San Diego and Los Angeles, Moran's art was ironically more than along for the ride -- in fact helping to underwrite the landscape's transformation. Note : The CDC was later taken over by the Southern Pacific Railroad, which retained ownership over much of the land in the Imperial Valley. Read a report on irrigation history in the valley through the 20th century here. But the painting also established a way of looking at landscape, informing how we see it as a collection of processes and clues to piece together. If we follow the history of the painting's hidden subject (the river) as well as its reproduced reach, we find ourselves in California, too. In 1905, Colorado floodwaters inundated the Imperial Valley -- itself formed by alluvial deposits from the Grand Canyon -- creating the Salton Sea. (See an animation of that geological event.) Through the containment and irrigation of the river that followed a new landscape of abundance was created in the former desert wasteland. 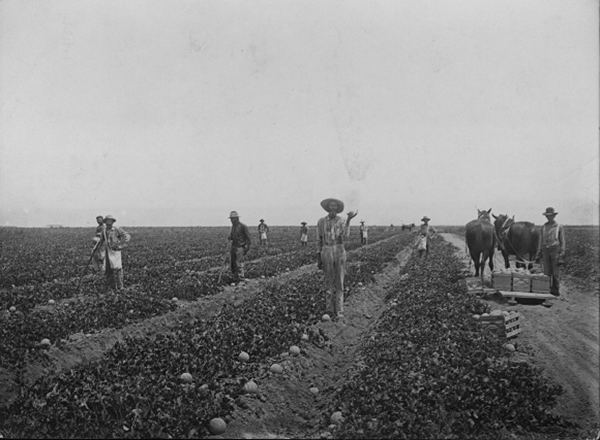 The agricultural bonanza that followed brought a great wealth to the Valley, and created large-scale farming as an essential leg of the California economy. Railroad companies, whose late 19th century desert expansion made the transport of these new crops economically viable, spun off real estate divisions, developing land they had received in kind from the government for their role in the Grand Surveys. In advertisements for their California holdings as fruit-and-honey Edens, they again relied on landscape as resource, representation, and selling point. Thousands of survey photographs, maps, local paintings, railroad advertisements, and fruit crate labels signaled Southern California as a new land of irrigated prosperity. Like Moran's painting, they did so by depicting landscape as a consequence of the Colorado rather than showing the water itself. In each, though not represented, its water remains the buried clue to landscape's transformation. Art is the point of entry to its discovery. Today the Colorado supplies water for Phoenix, Tucson, Las Vegas, Los Angeles, San Diego, and the Imperial, Coachella, and portions of the San Bernardino Valleys. The Southern California Metropolitan Water District alone currently takes 550,000-1 million acre feet in volume from the river for its own usage annually, watering lawns, coursing through faucets, and irrigating fields. By revisiting the varied forms of 19th and early 20th century landscape imagery for their aesthetic geography -- the history of images and the sprawling legacy of their influence -- we can see how art, science, commerce and industry collaborated to shape the landscapes that surround us even today, and, equally importantly, how we see, identify with, and understand them as our common political history. 1 See Nancy K. Anderson, "The Kiss of Enterprise: The Western Landscape as Symbol and Resource," in Reading American Art. Ed. Doezema and Milroy. (New Haven: Yale University Press, 1998): 208-31. 2 E-mail correspondence with author Stephen Fried. Fried discusses Moran's landscape advertising work in his recent book on the hotelier and entrepreneur Fred Harvey, Appetite for America (Bantam, 2010). Read an article on railroads and the southwestern landscape by Keith Bryant Jr., "The Atchison, Topeka and Santa Fe Railway and the Development of the Taos and Santa Fe Art Colonies". ** I am indebted to the seminal work on Thomas Moran and the landscape of the West by the art historians Nancy K. Anderson and Joni Kinsey, whose books Thomas Moran (Yale University Press, 1997) and Thomas Moran and the Surveying of the American West (Smithsonian Institution, 1992) are excellent sources for further information on the surveys and their art. Special thanks to Doug McPherson of the Temecula office of the Bureau of Reclamation and Cara Randall of the California Railroad Museum for lending their expertise. Susanna Newbury is a Ph.D. candidate in the History of Art at Yale University. She lives and works in Los Angeles.